Solicitors acting for Sinn Fein/IRA activist and former election candidate Jim Clinton, have threatened to sue Unionist Voice for linking him to the IRA, who control Sinn Fein. Unionist Voice indentified Mr Clinton in a list of those who had signed the sectarian pan-nationalist letter to the Irish Prime Minister, which made political demands under the guise of seeking the protection of ‘rights’. 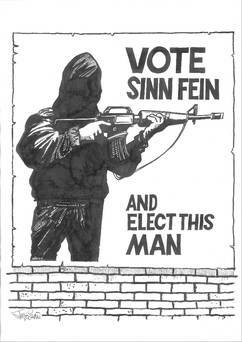 The letter was drawn up in conjunction with senior members of Sinn Fein and their arms length activists. The 2015 Government report into paramilitary activity, which came about following the IRA murder of Kevin McGuigan, made clear that Sinn Fein are controlled by the IRA Army Council. Mr Clinton’s brother, Sean, was arrested in connection with this IRA murder that led to the commissioning of the report. Sean Clinton is also alleged to have been a prolific IRA gunman during the conflict and responsible for the murder of a number of loyalists. Unionist Voice hold the position that given the inextricable link between Sinn Fein and the IRA, outlined by the British Government and alleged publicly by the First Minister of Northern Ireland and other senior political figures, that Sinn Fein and the IRA are one and the same. Any court proceedings would, of course, have to deliberate on this point and come to a conclusion as to whether the Government report is accurate, or not. Mr Clinton would, naturally, have to take the witness stand and deny being an IRA member. He would further be required to open himself up for cross examination, including in relation to whether he had any prior knowledge of the IRA murder of two prominent loyalists in 1994. Mr Clinton, who denies being an IRA member, was caught in possession of a gun in January 1998. He was a republican prisoner whilst on remand. Unionist Voice has agreed to amend the relevant article to reflect the fact that Mr Clinton stood for election for Sinn Fein, and was caught in possession of a gun, yet denies being a member of the IRA, who control Sinn Fein. 207 Responses to "Former Sinn Fein/IRA election candidate threatens legal action against Unionist Voice"
I certainly get irked at the same time as folks consider worries that they just don’t understand about. You managed to hit the nail upon the highest as neatly as defined out the entire thing without having side-effects , folks can take a signal. Asking questions are really fastidious thing if you are not understanding anything totally, except this post provides nice understanding yet. I am extremely impressed with your writing skills as well as with the layout on your blog. Is this a paid theme or did you modify it yourself? Either way keep up the excellent quality writing, it?s rare to see a nice blog like this one these days..
Hey very nice web site!! Man .. Beautiful .. Amazing .. I’ll bookmark your blog and take the feeds also…I am happy to find a lot of useful information here in the post, we need work out more strategies in this regard, thanks for sharing. . . . . .
it wise. I can not wait to read much more from you. This is actually a wonderful site. This post is truly a fastidious one it assists new net visitors, who are wishing in favor of blogging. What i do not understood is if truth be told how you are not really much more well-preferred than you may be now. Girl gaga! Your personal stuffs outstanding. Always deal with it up! up is written by way of him as no one else understand such precise about my problem. can easily discuss adult topics. Due to their popularity, webmasters increasingly opt to charge to the service. In this article, you will learn how you can find numerous these chat communities, many of which are entirely free. to pay a regular membership fee. To most people, it appears purchasing of proper, fun, lively free places for adults to have an adult chat have left. give a no cost service for females. community containing hundreds, sometimes lots of people making use of it at anyone time. Better yet, their rooms tend to offer users to be able to hook inside their webcams. and have to be able to select a user profile and view them on their webcam, too! The portal simply remarkable, is more than the such! I do trust all of the ideas you have introduced in your post. They’re very convincing and will certainly work. Nonetheless, the posts are very quick for newbies. Could you please prolong them a bit from subsequent time? Thanks for the post. Nice post. I learn something tougher on totally different blogs everyday. It should at all times be stimulating to read content from different writers and practice just a little something from their store. I’d choose to use some with the content material on my weblog whether or not you don’t mind. Natually I’ll offer you a hyperlink in your internet blog. Thanks for sharing. Wow, awesome weblog layout! How long have you been blogging for? you make blogging glance easy. The entire look of your website is excellent, let alone the content! I like the helpful information you provide to your articles. I’ll bookmark your weblog and take a look at once more here frequently. I am moderately sure I’ll be informed many new stuff right here! Good luck for the next! Hiya, I am really glad I’ve found this info. Nowadays bloggers publish just about gossips and net and this is really irritating. A good site with exciting content, this is what I need. Thank you for keeping this site, I will be visiting it. Do you do newsletters? Can’t find it. of this web site, this web site is actually awesome. Thanks – Enjoyed this update, is there any way I can receive an alert email when you publish a new post? regular basis, this web page is in fact good and the visitors are in fact sharing nice thoughts. Hey would you mind stating which blog platform you’re working with? I’m going to start my own blog soon but I’m having a tough time making a decision between BlogEngine/Wordpress/B2evolution and Drupal. The reason I ask is because your layout seems different then most blogs and I’m looking for something completely unique. P.S Apologies for getting off-topic but I had to ask! consider this, suppose you added a little information? I really wanted to make a remark to say thanks to you for some of the fantastic concepts you are placing on this site. My time-consuming internet lookup has finally been compensated with good knowledge to write about with my good friends. I would admit that we website visitors actually are quite fortunate to live in a very good network with very many lovely professionals with good methods. I feel very much privileged to have encountered the web page and look forward to many more enjoyable times reading here. Thank you again for a lot of things. needs? I wouldn’t mind composing a post or elaborating on many of the subjects you write with regards to here.